I feel Visa’s stock price is still misaligned with its overall revenue growth prospects with an unjustified P/E and PEG ratio that remains higher than the majority of large-cap growth stocks that have a greater growth profile. Visa’s management has forecasted continued revenue growth in the low double digits with EPS growth in the mid-teens, artificially high due to share buybacks. This forward-looking revenue growth rate is a shape divergence from the post-Europe Visa acquisition revenue growth numbers. 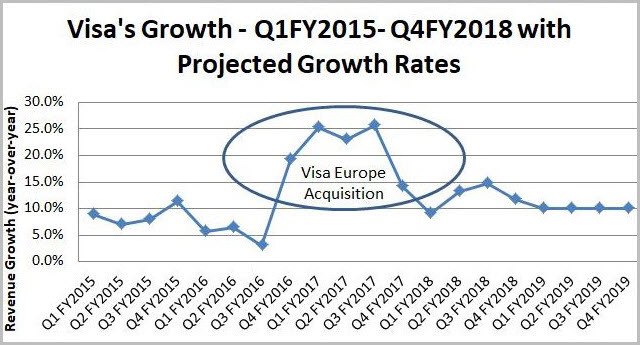 Visa’s growth rate is slowing from these artificially high post Visa numbers thus misaligned with its growth profile. Investors have been accustomed to year-over-year quarterly revenue growth in the double digits over the past year, specifically post Visa Europe acquisition. FY 2018 quarterly revenue growth numbers came in at 9%, 13.2%, 14.7% and 11.7% which is clearly a different growth narrative when looking at the post-Visa Europe acquisition growth numbers in the 20%-plus range (Figure 1). These trends indicate that year-over-year growth rates are largely attributable to Visa Europe. After a full year of Visa Europe earnings on the books, these growth rates have now come down and are single to low double digits and slowed down dramatically. Any miss or significant slowdown in future quarterly earnings could derail this stock as it's priced for perfection. I’m taking the revenue position in this analysis as this is the true measure of business activity and growth. EPS, P/E and PEG can all be misleading in different ways and easily be financially engineered via share buybacks which Visa is definitely engaging in and buying back shares at all-time highs. While EPS growth is ostensibly great, without revenue growth, it’s meaningless. This stock has appreciated 20%-plus in 2018, is richly valued and possesses a lofty premium relative to other large-cap growth stocks. The Federal Reserve expects the economy to continue to strengthen and inflation to rise in the near future. The economic strength coupled with the threat of inflation provides an environment that’s ripe for rising interest rates. The Federal Reserve has been very bullish on the domestic front and signaled that rate hikes will continue and may even accelerate its pace of rate hikes contingent on inflation and economic strength. Federal Reserve Chairman Jerome Powell stated that the unemployment rate currently stands at 3.9%, near a 50-year low while core inflation is right around 2%. Powell said that these two metrics are part of a “very good” economy that boasts “a remarkably positive outlook” from forecasters. The central bank approved a quarter point hike rate in the funds rate that now stands at 2.25%, and the committee indicated that another rate hike would happen before the end of the year. 2019 will likely see three more rate hikes and 2020 will see one rate hike prior to pausing to assess the delicate balance of rising rates in the midst of a strong economy while taming inflation. An inverted yield curve is an interest rate environment in which long-term debt instruments have a lower yield than short-term debt instruments. This type of yield curve yield is widely considered to be a predictor of economic recession. Historically, the inverted yield curves have preceded many recessions. Due to this historical correlation, the yield curve is often seen as an accurate prediction of negative business sentiment and the ensuing economic slowdown. An inverse yield curve predicts lower interest rates in the future as longer-term bonds are being demanded, sending the yields down. The economy would certainly be negatively impacted by an inverted yield curve as the gap between long-term and short-term Treasury yields potentially unfold and serve as a reliable predictor of difficult economic conditions ahead. Banks borrow at short-term rates via deposits and interbank lending and lend at long-term rates to businesses, autos, and home loans. Thus, when long-term rates exceed short-term rates, bank lending is profitable, and the opposite is true under inverted yield curve conditions. This typically signals troubled credit markets via restricted access to capital and reduced lending to fuel the economy. Many are concerned about the length of the economic rebound after the financial crisis with unemployment at 3.9% or nearly a 60 year low with consumer confidence at near record levels, translating into a recovery that may not last much too much longer. We are late in the economic cycle, and the benefits of tax reform are baked into equities. There’s been bearish commentary as of late and concerns that the Federal Reserve may be tightening too quickly and may derail the strong economy. If slowing comes to fruition, then the consumer will likely retreat, and the payment processors will suffer as a result. PayPal has been a growing threat over the years and PayPal’s CEO Dan Schulman on Mad Money regarding the prospects and future of the payments space as he sees it, domestically and internationally. "The entire financial systems' ecosystem is moving more rapidly than ever before away from cash and towards digital payments because of the explosion of mobile phones." "If you look at markets like China or India, India really going through demonetization right now, they never really had point of sale terminals, credit card and what they're trying to do now is do everything through digital"
"When you go through digital its's a more efficient system, there aren't middlemen in-between to take part of the transaction and there's less corruption"
"You're seeing leap frogs over what were credit card infrastructure or checking." His comments shed light on the potential pivot away from credit card infrastructure to digital payments and money management in the digital age, particularly in India and China. PayPal has witnessed explosive growth in the digital payments space and peer-to-peer money management and transfer via its Venmo platform. Another huge potential disruption in the credit card transaction space lies in blockchain technology that underpins the cryptocurrency markets. This technology is applicable to enterprise applications using its decentralized database, open ledger, and incorruptible transactional capabilities. Financial intuitions are already engaging in pilot programs to migrate away from traditional networks like Visa’s. American Express, for example, is exploring this technology with Ripple’s blockchain technology. Visa has a partnership with BTL Group (BTLLF) and IBM (IBM) exploring this superior technology for potential use. IBM is aggressively stepping into the enterprise blockchain solutions space as well. Google (GOOG), Facebook (FB), NVIDIA (NVDA), JP Morgan (JPM), Alibaba (BABA) and other big movers in technology are pivoting towards blockchain to harness its power to augment their respective business for the future. CEOs across a broad range of industries are investing heavily in blockchain. Global spending on blockchain solutions is set to more than double to $2.1 billion this year per a Cowen report. "Blockchain's going to be here for a long time and it's going to be a fundamental new form of computing." Going further, "Blockchain requires cryptography and the ability to have a public ledger that is completely immutable, perfectly safe, distributed all over the world." This comprises a very short list of major players in distinct spaces all trying to leverage blockchain technology thus providing a consensus that this will likely be a powerful force for future transactions. Amazon (AMZN) is a potential threat to any business at this point, and the credit card transaction space may be next. Amazon is offering to pass along discounts it gets on credit-card fees to other retailers if they use its online payments service. Credit card swipe fees are a $90 billion-a-year business for lenders and networks such as Visa’s which pocket a fraction of every sale when shoppers swipe cards. Amazon has been able to negotiate lower rates based on their sales volume. Now, Amazon is offering to pass its discount along to at least some smaller merchants if they agree to embrace its Amazon Pay service. Visa Inc. (NYSE:V) is facing a growth slowdown and in my opinion, does not justify this lofty valuation and stock price. Visa did not possess the growth characteristics to justify its valuation, and its appreciation was largely a function of its Visa Europe acquisition and the overall bull market. Despite this market wide sell-off throughout Q4, Visa has delivered great returns in 2018, appreciating 23%. Visa faces emerging threats in the digital payments space, blockchain technology and maturing markets in the traditional payments space such as credit card infrastructures being by-passed in India and China which are all potentially leading to slower growth prospects. I feel that headwinds are ahead for further stock appreciation with growth clustering around low double digits and high single digits. There is a trend away from the traditional credit card space among the younger demographics that embrace PayPal and PayPal’s Venmo for payment options and exchanging payments between multiple parties. I feel that shareholders have become overly enthusiastic about Visa’s growth prospects and the benefit-reward profile at these levels, in my opinion, is non-optimal unless the market wide pullback brings Visa more in-line with its growth profile. Thanks for the article, Noah. Can you suggest a medium-term price target for V? That's tough but I feel that a catalyst is lacking here and the broader economic trends point to a mild slowdown domestically. Hosing is slowing, rates are rising, unemployment isn't going to go any lower, tax breaks are factored into any growth and the consumer is as strong as it gets. Visa is already richly valued with a growth rate that does not support its valuation however its always had a valuation premium. Visa is a great company, I just don't like the risk-reward at these levels.